It’s not as pronounced in flavor as peanut butter which can overwhelm a cookie. Almond butter is mellower with notes of deeply roasted nuts, adding a subtle, golden background to the dough. Whisk the flour, baking soda and salt in a bowl; set aside. Cream the butter and both sugars in the bowl of an electric mixer for a couple of minutes or until light and fluffy. Add the egg and vanilla. Mix well. Mix in the almond butter until smooth. Add the flour and mix to combine, then stir in the chocolate. Refrigerate the batter for at least one hour, or up to 24 hours. Heat oven to 350 F. Drop rounded tablespoons of dough on baking sheets lined with parchment. Bake until light golden, about 14 minutes. Optional: Sprinkle a few flakes of sea salt on the cookies before baking. Lynda, once again your blog pointed me in a tasty direction! Thank you! Hello! your blog is great, I’d love you to join my websites of kitchen, and you put my link on your site, and so we benefit both. Those cookies look great! I think I might have to make another batch today. Thank you for the link! Glad you enjoyed it the post…. I’m more than happy to be overwhelmed by peanut butter myself 😉 but almond butter is also a favourite in this house! 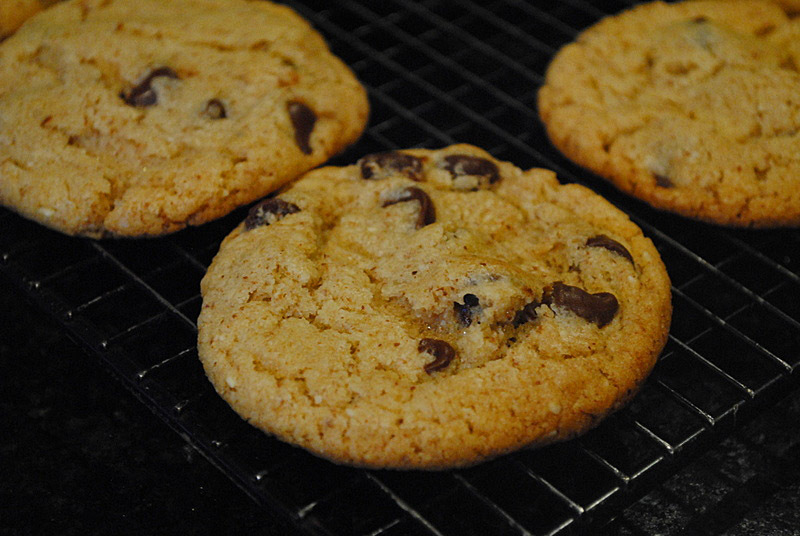 You wouldn’t believe Sally that I just made the boys a batch of homemade choco-chip cookies as a Valentine’s day surprise… great cyber minds think alike… your cookies look chewy delicious! You are so right, oh great cyber minded lady! I am thinking of a fudgy concoction for Vday, but not for us, to take to the lab & department. We shall see the level of energy I have tomorrow evening. I’ve not used almond butter in the few cookie recipes that I bake but, if it adds even a hint of almond paste flavoring, I’m all in! I can see I need to bake more cookies and give this a try. Thanks! Carole, cannot tell you how much I loved seeing you here… Actually, I think you can imagine! 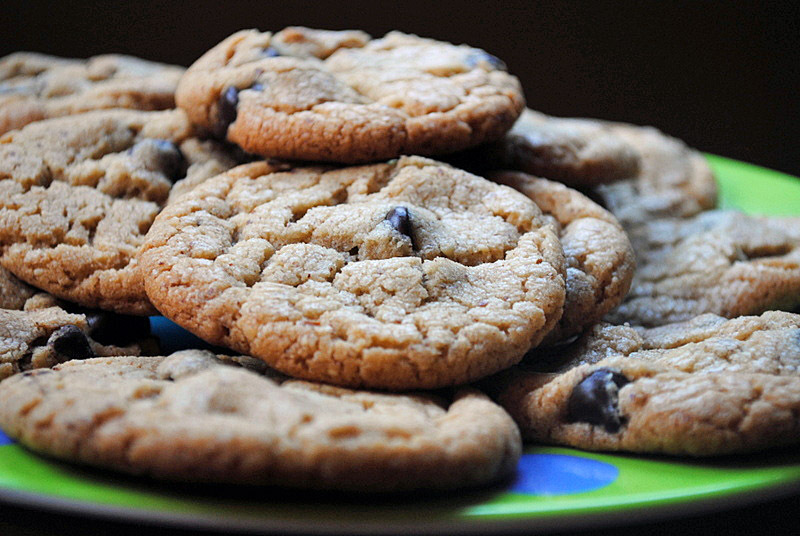 I’m an equal opportunist nut butter fanatic so these cookies sound amazing to me! I’m so glad you gave almond butter a chance! I wonder how I would like almond butter. I like almonds, but I’ve not been crazy about almond flavors in my desserts. Kind of similar to you and peanut butter, which by the way I love and could eat by the spoonful. I do love PB with bananas. I may have to explore this almond butter. Let’s go on a nut butter exploration, then…. as I mentioned in the above comment, cashew butter will be next for me. Those things are expensive, but worth exploring! I think these could be my new favorite cookie. I bet they’re super creamy.